It acquired the stake for an undisclosed sum from Japanese business conglomerate, the Marubeni Corporation, it announced. GIG is the green energy investment business of financial services giant, the Macquarie Group. It is also part of a consortium with Macquarie’s European Infrastructure Fund 5 (MEIF5, for projects within the European Union, as well as in Norway, Switzerland and Iceland) and higher education pension fund, the Universities Superannuation Scheme (USS), which already owns a 25% stake in Westermost Rough. Danish developer Ørsted owns the remaining 50% stake in the project. Westermost Rough, commissioned in 2015, was the first commercial deployment of Siemens Gamesa’s SWT-6.0-154 turbines. It also featured what Ørsted (then Dong Energy) claimed was the first use of radar to measure offshore wind. Edward Northam, head of GIG in Europe, described it as "a landmark project in the evolution of the offshore wind industry, both in the UK and internationally". Following the divestment of its Westermost Rough shares, the Marubeni Corporation stated: "Marubeni is committed to actively supporting the global energy transition to renewable energy with the aim to increase renewable energy capacity in our portfolio to 20%, doubling the past target. "In order to achieve that ambition, Marubeni is keen to deploy the skills and knowledge we gained from our investments in offshore wind farms, including Westermost Rough." The group added: "We look forward to exploring further collaboration opportunities with [GIG] in the future." GIG has stakes in six operational wind farms with a combined capacity of 1,657MW, off the coast of the UK. 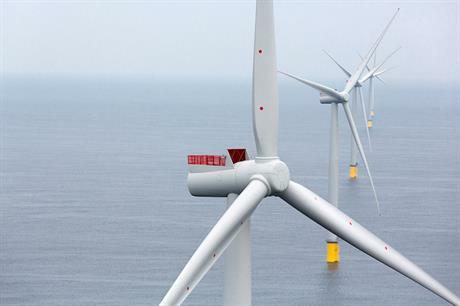 It has also invested in the 353MW Galloper and 400MW Rampion sites being built off England’s south-east coast, and in the 26MW Glens of Foudland site on land in northern Scotland. Marubeni had previously invested in the 173MW Gunfleet Sands wind farm off the coast of Essex in the east of England, but sold its 49.9% stake to the Development Bank of Japan in 2013.